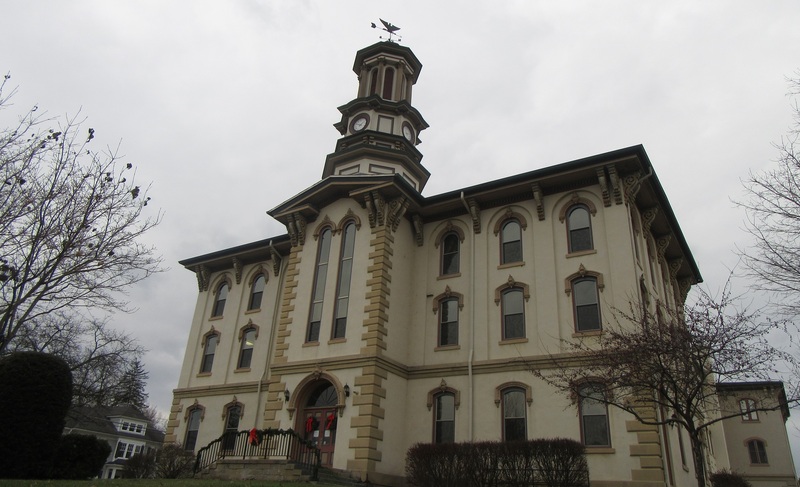 Cloudy skies over the Wyoming County Courthouse on Monday mirrored the mood inside the building as employees mourned the passing of Commissioner Ron Williams (above, right). 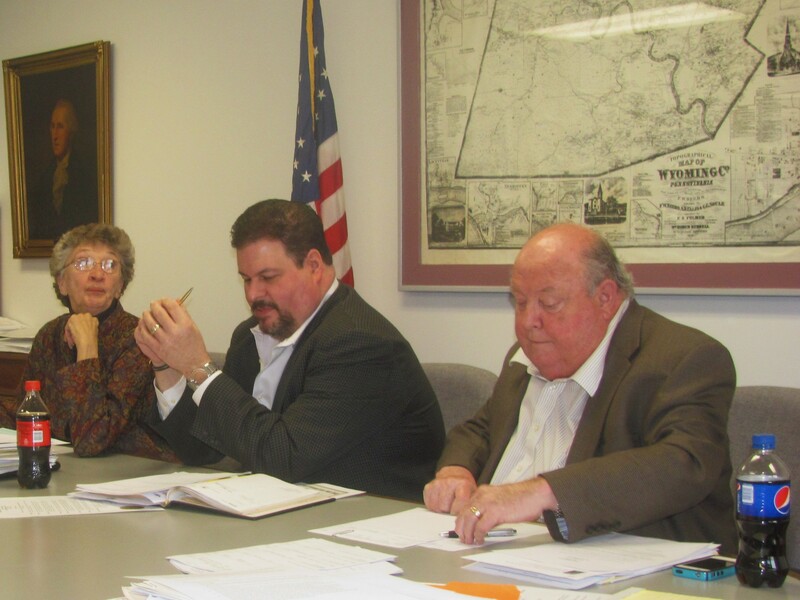 Long-time Wyoming County Commissioner Ron Williams passed away on Dec. 15, following a lengthy battle with cancer. He is being remember by his coworkers and constituents as a dedicated public servant, loving husband and father, and genuine friend to many. Williams served as commissioner from 1987 to 2003 and again from 2011 to 2018. Prior to that, he retired from the Tunkhannock Police Department as a corporal. He served as the northeast regional director of state’s Department of Agriculture from 2008 to 2011. He was also a veteran of the United States Army Reserves. Though Williams had not been at the Wyoming County Courthouse regularly for several months, the mood there was somber on Monday as county employees acknowledged that they would never again see Williams walk through the door. Williams preceded both Judy Mead and Tom Henry on the board of commissioners and, on Monday, they were tipping their hats to the legacy of a man who willingly shared his insight, worked in unison with them despite differing political affiliations, and always did what was best for the citizens of Wyoming County. Williams’ position as commissioner led him to other endeavors, sometimes as an official representative of the county and sometimes as he followed his own interests and passions. He chaired the Northern Tier Regional Planning and Development Commission, served as vice-chair of the State Resource Family Association, and as a member of the Wyoming County Special Needs Committee, the Lake Winola Fire Company, Black Walnut American Legion, and Lions Club International. Williams was highly regarded for his love of and concern for the welfare of all children, sharing a mixed family of biological and adopted children with his wife, Ellen, with whom he celebrated 28 years of marriage in August. In 2015, he was recognized for 25 years of service to with the Statewide Adoption and Permanency Network (SWAN). “If he had to make a tough decision, he made it,” Gaylord remarked. While county officials mull the most appropriate way to honor Williams’ legacy, several mentioned that they will surely miss his sense of humor. “He always made me laugh with his quick humor,” Henry added, recalling rides to meetings in Harrisburg with Williams, as the elder statesman reeled off one joke after another. “I will certainly miss those laughs,” said Mead, noting that she and Williams did a lot of teasing of each other through the decades. The funeral arrangements for Commissioner Ron Williams are being handled by Kearney Funeral Homes of Scranton. Calling hours for the public were scheduled for Wednesday evening at St. Mary of the Lake on Dalton Road in Lake Winola, with Mass of Christian Burial planned there at 10 am Thursday. Military rites by the AMVETS guard are slated to follow at Fairview Cemetery, where Williams will be interred.